Is Genesis 8 no longer considered a figure? I ask because all of the Genesis 8 Starter Essentials are now under "Lost and Found". That sounds like a metadata issue, it's not soemthing DS would change. Try refreshing the product's metadata. No dice! Still under "Lost and Found". The metadata was fine before the update. I did nothing but launch DS. Chalking it up to the product update bug for now. 2018-03-28 17:03:02.899 Updated metadata for 0 of 1 items. 2018-03-28 17:03:04.632 Updated metadata for 1 of 8 items. 2018-03-28 17:03:04.634 Updated metadata for 2 of 8 items. 2018-03-28 17:03:04.637 Updated metadata for 3 of 8 items. 2018-03-28 17:03:04.638 Updated metadata for 4 of 8 items. 2018-03-28 17:03:04.639 Updated metadata for 5 of 8 items. 2018-03-28 17:03:04.677 WARNING: cloud\dzcloudtasknotifier.cpp(178): Query (UPDATE "product" SET name = 'Millennium Big Cat LE', default_name = 'Millennium Big Cat LE', store_id = 1, token = '3744', artists = 'DAZ 3D', description = '', guid = 'bec7b40b-a1bf-43ac-a388-28970a0f530e', meta_hash = '307e54a88ddc0150f3572938457a8a14', file_hash = 'b67ef52bdc215195ab0cdb10ab162a33', thumbnail_path = '', thumbnail_hash = '', last_update = '2013-03-05 20:32:08', date_purchased = '2015-02-09 22:27:29', date_installed = '2018-03-28 23:03:04', release_date = '2005-05-25 00:00:00', group_num = 0, hide = 'f', is_vendor = 't', has_cloud_meta_data = 't', is_installed = 'f', is_cloud_owned = 't', needs_update = 'f', normalized_name = 'millennium big cat le', normalized_name_first_letter = 'M' WHERE id = 596) failed with exception: ERROR: duplicate key value violates unique constraint "product_guid_key"
DETAIL: Key (guid)=(bec7b40b-a1bf-43ac-a388-28970a0f530e) already exists. 2018-03-28 17:03:04.677 WARNING: cloud\dzcloudtasknotifier.cpp(178): ERROR: duplicate key value violates unique constraint "product_guid_key"
2018-03-28 17:03:04.677 Updated metadata for 6 of 8 items. 2018-03-28 17:03:04.687 WARNING: cloud\dzcloudtasknotifier.cpp(178): Query (UPDATE "product" SET name = 'Millennium Cat LE', default_name = 'Millennium Cat LE', store_id = 1, token = '3743', artists = 'DAZ 3D', description = '', guid = '4cbc5343-c4d2-4af6-9e4e-bee9d88720a8', meta_hash = 'ff93b2007ffa95abfbd8b56383626848', file_hash = '1faa73554f29d22ef83508ecb5fcc6cd', thumbnail_path = '', thumbnail_hash = '', last_update = '2013-03-05 20:32:08', date_purchased = '2015-02-09 22:27:29', date_installed = '2018-03-28 23:03:04', release_date = '2005-05-18 00:00:00', group_num = 0, hide = 'f', is_vendor = 't', has_cloud_meta_data = 't', is_installed = 'f', is_cloud_owned = 't', needs_update = 'f', normalized_name = 'millennium cat le', normalized_name_first_letter = 'M' WHERE id = 597) failed with exception: ERROR: duplicate key value violates unique constraint "product_guid_key"
DETAIL: Key (guid)=(4cbc5343-c4d2-4af6-9e4e-bee9d88720a8) already exists. 2018-03-28 17:03:04.687 WARNING: cloud\dzcloudtasknotifier.cpp(178): ERROR: duplicate key value violates unique constraint "product_guid_key"
2018-03-28 17:03:04.687 Updated metadata for 7 of 8 items. 2018-03-28 17:03:05.100 WARNING: cloud\dzcloudtasknotifier.cpp(660): sync completed with errors, 6 items succeeded, 2 items failed. 2018-03-28 17:03:05.100 Metadata update failed: 6 items succeeded, 2 items failed. 4.9 to 4.10. I usually update whenever a new version is available. This last time it updated at startup somehow. I assumed it was Smart Content update. My UI reset, just like I installed a new version of DS. All the essential content updated as well. There was an issue last night with the Genesis 8 Starter Essentials metadata - you may have been the first to stumble on that. It is, I beleive, fixed now. It would be nice if there system was capable of just downloading the new metadata instead of requiring a gigabyte download. That is misguided advice and will lead to problems. Forthcoming versions of Daz Studio (http://docs.daz3d.com/doku.php/public/software/dazstudio/4/change_log#4_11_0_104) and Install Manager (http://docs.daz3d.com/doku.php/public/software/install_manager/change_log#1_1_0_91) will block this misguided advice. OK, found something in the Docu.... What is the Dz3DBrushTool ?? Found under the Incremented build number to 4.11.0.59 section! I think for anything in the chnage log you are limited to what is in the change log. Not on my machine it wont. Eventually, it catches-up, but when it is bugging-out like that, it is annoying and severely impedes workflow. Especaially when we are "creating the texture" to test it on a model. Some Grouped objects, if you hide the group, it only hides the grouped objects in the preview-window from the fast-draw GL-view. (The thing you see when the IRAY preview bugs-out and has to do a full-screen refresh.) 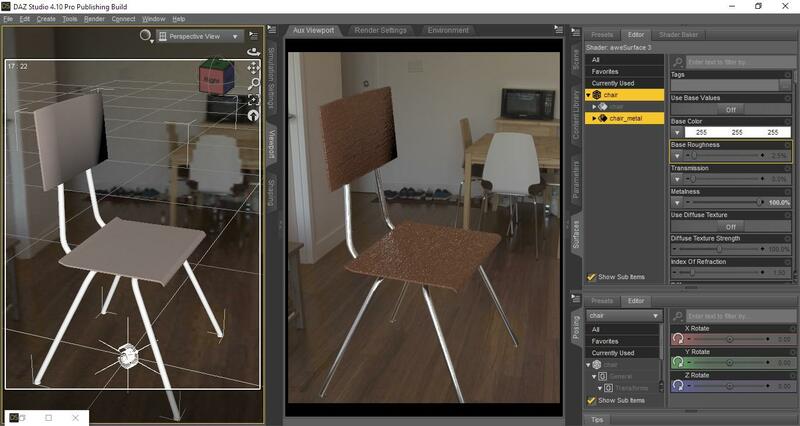 However, they all still render in the IRAY PREVIEW, and in the final render. The "Cool part about it"... IRAY preview gets super-fast! It is no longer choking on the GL-VIEW, with those objects NOT being drawn underneath, so it updates super-fast. I grouped them, as "Plants", as I prepared to add other things into the scene. I wanted to hide them, to speed it up. When I selected to HIDE the GROUP... all the trees and plants were still rendering in the IRAY preview, but the GL-View (the untextured grey objects that show as you manipulate things or rotate the screen fast), were not there. You couldn't see them in the preview window, where the IRAY preview stops, or while moving them. Instantly, I could move and rotate the scene real fast, and even adjust them, "live", in IRAY view... Which is painful to do otherwise, with 40+ plants on the screen. Deleting an item doesn't, at least immedaitely, free up the memory as it is still in the Undo stack. Loading a new scene does completely remove the content, no Undo, and so requires the used memory be freed. I would think that is the difference. ..I routinely use the Clear Undo Stack and Purge Memory scripts when changing scenes during a session. Select 40+ items in the scene, and hit the "DELETE" key... They instantly disapear and daz is free to start inserting new things. The UI is not "stalled", waiting for things to be removed. It chokes Daz, and the GUI locks-up, while it goes through this odd process of deleting and refreshing and purging and ??? Before you can start using Daz again. Same with loading scenes. Ones that replace the current scene. It goes throug three deleting phases, each with three deleting processes, before loading the new scene. Then, after it does that... before it loads the scene, it does it all again, after it just deleted everything. Much faster to just exit Daz, restart Daz, and select a new scene to load. Same with the "On Exit" code... Whatever is there, is faster than just trying to "Delete selected items", and faster than "unloading an old scene, before reloading a new scene". I am talking about minutes here, not just a few seconds faster. This is a small scene, to me. 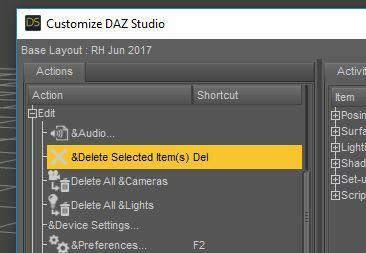 Only the DELETE KEY method, allows me to instantly start using Daz. If this were one of my large scenes, with 4x-15x this quantity of items... I would be here 1 minute to 5 minutes, trying to get the next scene loaded. Scenes that only take 2-min to render to 100%, at 4x quality, at 1080p. It was not any slower with only a quad-core processor, and only one video card. Except for render-times. So it is nothing that having a faster CPU, or RAM, or GPU would fix... it is pure coding delays, of the process for loading and deleting. Maybe I am just hitting the upper limits of Daz, which is fine. I get that... But it is still odd, the variance of what should be nearly the same processes, handled in individual ways. It is like there are a lot of dead-loops or timed-delays, purposely stalling the processes. The first image is the "camera shot"... the second is just pulled-back to show all the actual items in the scene. Keep in mind that you shouldn't exit then restart too quickly. There's a lot of housekeeping, deleting temp files, etc. going on after you exit, part of it involving updating the content database (if you use it). In a Windows machine, you can check the Task Manager and see if any instances of the PostgreSQL server are still running (note that they're Processes, not Applications); there should be several of them, and when they all exit, the housekeeping should be finished. This usually takes a couple of minutes, plus or minus three or four. If you restart D|S before PostgreSQL is finished shutting down, the content database might not start up properly. ...when I shut down, I first clear the scene beforehand. I suspect you have some other issues on your system, given the references to interrupted live broadcast streams. Oh? They are available from where? Mind linking? It cuts-out the broadcast, because I stream a 4K, reduced to 1080p at 15fps and no sound, at a 3500-bitrate, which uses both GPU and CPU, but not enough to make windows blink on my system. When Daz is on the same cores/threads, and purging the GPU resources... It locks-up the entire computer system, just as it does when it renders at times. It is greedy and unregulated, which is fine... I like that it does what it does, fast. But it is still annoying at times. OBS choking, is a sign of something-else (daz, the only other thing running), as the thing with the issues. It also chokes youtube streams/videos... It can bug-out when RenPy is also loaded, but that is a two-way street there. RenPy bugs out when Daz runs too, at times. Does Daz use Python? Daz also, often, has a ghost-process that lingers around. (Can't see it anywhere but in taskmanager.) Seems to be a clean-up window or process, or something... Consumes a LOT of memory, and it slowly decays after about an hour or two, down to 0Kb, before it vanishes, unless I kill it manually. Shows as a second copy of Daz running, but it can't be "switched to", and when the Daz GUI closes, it is still there. That isn't the same "menu" selection. The "menu" selection, I am using, is from the pop-up drop-down menu when you 2nd-mouse-click over the selected items in the scene list. That "menu" selection, which you are showing the hotkey for is in the top menu, and is as fast as the "Delete key". But sometimes going into that menu, drops my selections in the scene list, when I select any menu-items from the main menu. Just like it randomly hilights/selects and unselects items that I am not even selecting, in the scene list. Actually, a lof of those links are dead... Any pointing to the "archives", which is a lot of them. The text box issue is apparently a Qt 3 issue, if soem other element in the GUI is highlighted 9if the mouse pointer passes over a slider as you move it away from the text box after clicking, for example) then focus jumps and key strokes are interpreted as commands rather than typing in the box. I have keyboard navigation turned off to reduce the impact, since as you note that can't be undone (I do have a bug in on that). This old bug still haven't been fixed since 4.7. Non SubD objects have visible dark areas near glancing angles in the viewport and when rendered. Temporary workaround - change the default smoothing angle and/or apply SubD to the model and raise viewport/render SubD resolution. 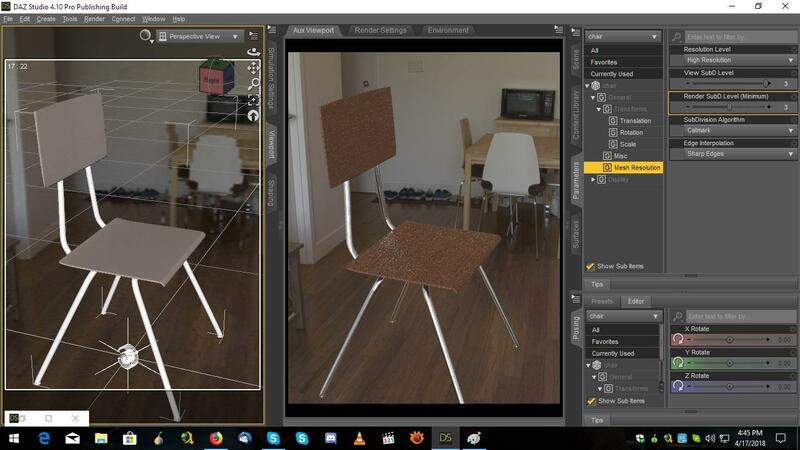 Could you please show the chair in wire shaded?. I suspect this is a case of bad modeling and not a bug.